Portable Recording Studio with your iPod? Belkin has a product coming out that looks rather good. Belkin Podcast Studio. 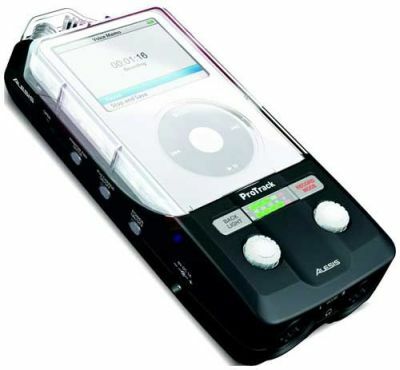 Belkin Podcast Studio is an advanced attachment for your iPod to add high quality recording capabilities. Dual XLR and 1/4-inch channels offer a solid range of recording options. A built-in mic and speaker are powered by their own battery, saving your iPod juice better used for listening to your genius later. Engadget has some more pictures of it. Seems no one knows if it has phantom power or not (probably not), and it seems to be 16 bit. Though, if you hook up a iPod Nano to it, and have 4+ gigs of free space, that would easily give you 6 hours of 16bit 44.1Khz recording. Two potential problems. First, battery life. If it is iPod battery powered, who knows how long it will last. Plus, if it has phantom power on the XLR plugs, that would probably kill the iPod’s battery in no time. Recording on my Marantz flash recorder using phantom power pretty much kills 8 AA batteries if I record 3 hours of stuff. Second problem, Windows formatted iPods. You can’t get, as far as I know, over 2 gigabyte files on a FAT formatted drive. I tried copying Pirates Of The Caribbean on an FAT (PC) formatted iPod that was 2.6 gigabytes in size. The iPod did not like that. Mac formatted ones didn’t complain. So, it’s an interesting idea, especially since most everyone already has an iPod, but until we see it actually come out (June? ), we can only guess. After nearly 3 years of faithful service, my 3rd generation iPod died. It wasn’t the battery. It was the hard drive. The hard drive finally decided to check out. I was sad. For the last 2 or 3 weeks, I’ve been going through iPod withdrawal. Shuttling my music files between home and the studio is a pain. I’ve been using a “portable HD” that I usually use to backup my stuff. Plus, those nights when you want to listen to music before going to bed? Or in the car? So, it was a choice between an iPod Nano or an iPod (with video). The Nano is very nice. A number of my students have them. However, 4 gigs is just too small. My finale files I transfer back and forth take up nearly 500megs, plus if I wanted to put all my Aebersold play-alongs on there, I couldn’t. So, I decided to go with the iPod. Wow…..
First off, it “looks bigger”. But it is not. In fact, it is the same width, and the depth is almost half that of my 15 gig iPod. It looks bigger due to the screen. And the screen is absolutely incredible. Clear, color, crisp. Man, in 3 years they have done wonders. I haven’t watched any videos on it, but I imagine they look great. Sound quality is great. I plugged in the standard headphone and it sounds great. I plugged in my Shure headphones, and it sounds “greater”. Two bad things. First is the case. It’s really flimsy. I am planning on getting a better case ASAP. I don’t want any scratches. Second bad thing, no dock. My previous iPod came with a nice little dock, this one comes with nothing. They will sell you one for like $40. Um. No. Not right now, thanks. Rating. 8 out of 10. No dock and a poor case are the two points taken off. They could have at least done a clip case like what came with the 3rd generation iPod. And no dock, that’s just cheap Apple. Update: 02/28 08:50 GMT by E :Found another interesting thing. When you unplug the headphones while playing, the iPod will put what it was playing on Pause for you. That is a very nice little thing to have. Electronic Musician reviewed a bunch of field recorders, including the the Marantz 671, Marantz 660 and the Edirol R1 among others. Basically, they panned the Marantz 671 (successor to the 670, which I love) for having firmware issues causing the mic preamps to be noisy. The Edirol R1 came out on top of the two Marantz units. Though I would really call the article a “introduction” to field recording. They do not list exactly what they tried to record, and with what. We all know that the microphone is key to getting a good recording. I would totally recommend the Marantz 670. I used it this weekend and got some great recordings putting it about 6 feet infront and 7 feet above the band. Of course using my Rode NT4 mic (awesome piece that it is). I imagine the issues with the 671 have been fixed. I would take the EM article with some grains of salt. The reviewer used these units to record a snare drum (why?? ), the “ambience in a suburban neighborhood” (um, ok), and dialog. Ok, great tests there. NOT. Oh, and EM was reporting, like it was news, that Sony introduced a new format called MiHD. Um, guys, these things have been out for OVER A YEAR. Get with the program!